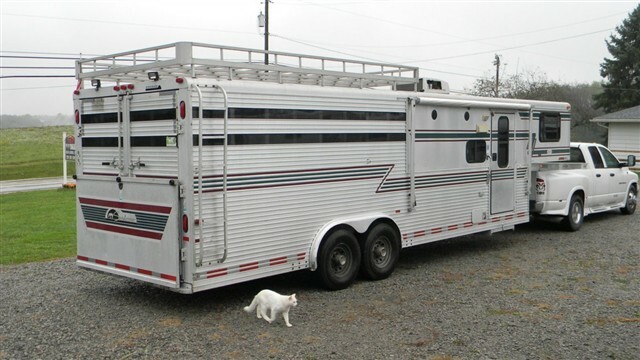 Description: Park Side Trailers has received on trade a 1998 Sundowner Sunlite 4 Horse Aluminum/aluminum frame/aluminum floor 8'wide trailer with a 9'6 shortwall with a Siesta pkg. Living quarters. Very nice condition!! Has hay rack, rear ramp over double doors. Plexi enclosure in air gaps. Box length 25'2" For more information, please contact Rhonda at 330-692-0374 or email: Rhonda@parksidetrailers.com Also, has Full Stud wall. No mangers. Tires & brakes, good condition. Electric Jack. Needs awning fabric.